Okay, you’re gonna tell me “Seriously, another Lana Del Rey song?”… I KNOW!! I’m so obsessed and (overenthusiastic)… as usual. I CAN’T HELP. Her music is SO good. I bought Born To Die – The Paradise Edition like 2 months ago because it was only 4,99 €. I hated Video Games when it came out, but I don’t know… I thought : “I should listen to this album… give Lana another chance”. And I’m so glad I did because it’s perfect. LANA ROCKS. 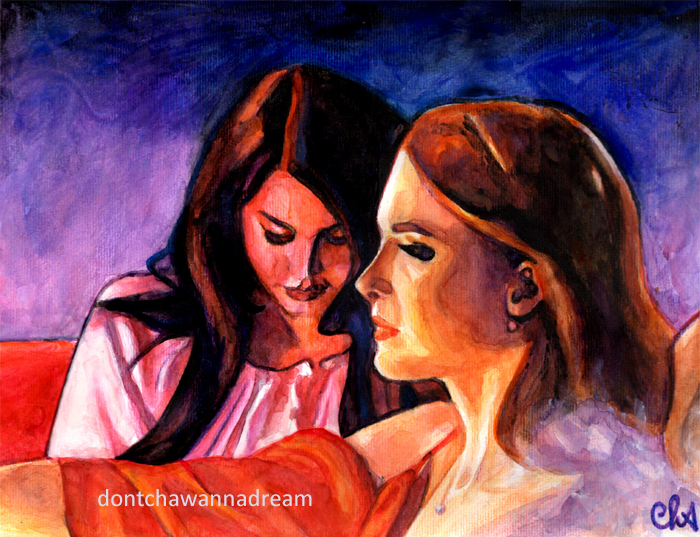 “Summertime Sadness” is definitely one of my favorite songs from this album. Here’s the video clip of the remix by Cédric Gervais (I usually don’t like remixes… but this one’s awesome!). Great post, I do like this remix. I have a friend in the music industry who does stuff like this and I think he’d agree that it is a good piece. She’s so brilliant. Pure talent! Muy buena la pintura Cha. Y a Lana del Rey no la conocía, pero me encantó este video. No la conocias?? Ohhh Marta, deberias escuchar sus canciones. Son perfectos. I’m not familiar with most of the new music, but that was pretty good. And of course your portrait is really good, too! So I’m glad you like it as well. All your portraits are worthy of being proud of! As you know it is not my favorite style of music but I listen her very then and now. BTW I prefer the original version. I have a “wide ear”, too, but my favorite is jazz (and all the substyles). Lately I’m trying to play some jazz on guitar. It’s hard but I love how you can create and re-create the same tune. I could play Autumn Leaves (Les feuilles mortes, you know) for hours and I wouldn’t use the same chords. Classical, blues, rock… I’m starting to listen country and the so called “americana music”. Old French music, for example, Brassens, Moustaki… I like everything, too! Not too sure who Lana Del Rey is…except that you like her..hehehe. I do like her voice though..deep..and I don’t know…magnetic? Maybe..hmm..
Ohhhhh really? To me she’s as “famous” as Lady Gaga… I don’t know, maybe it’s just me. Yeah that’s the word: “magnetic”!!! Haunting too. Yeah, me too. I really don’t like remixes usually, but I found some very good stuff for Lana’s music!!! Thanks a lot for all your comments. REALLY!! I discovered her on Spotify. Love her music. Great song. And your art captures exactly how the song feels to me. 🙂 Amazing work Cha! I’m so happy that you think so!! Your illustrations here are amazing. What beautiful talent you have. Merci!!! 🙂 That really means a lot. Happy holidays and thanks for taking the time to comment.